Officers found debris of the house littered throughout the neighbourhood. Mr. Westcott's single-storey home was decimated, and a silver van, in what appears to be a driveway, had wood chips around it. Ms. Gaynor said some of the homes don't have gas or hydro and need structural engineers to look over their properties. 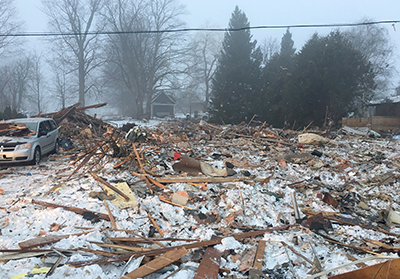 Components of debris have been taken to the OFMEM's laboratory in Midhurst, where an expert will examine pieces to try to determine how the explosion happened. “We certainly don't want to be narrow minded and go down one path,” she said. “We want to be open to any possibility and that's why it's going to take a significant amount of time to go through all the debris. Caterina Camilleri, who lives nearby, said she was shaken up, in disbelief and is staying at a friend's house on Kennedy Road.